Have you ever noticed small, twisted spider veins on the surface of your skin that are red, blue, or purple in color? Or maybe there are some twined and enlarged superficial ‘varicose’ veins on your legs, which are very much visible through the skin. Whatever is true in your case, they are very common and quite displeasing to look at (sometimes even painful too!). So, if you are looking for an effective way to treat these common issues, Asclera can be the answer. Here is everything you should know about the injection for changing the way your skin appears. What Is The Asclera Treatment? The Asclera treatment is basically a type of sclerotherapy treatment in which an injection of a chemical irritant is used to ‘sclerose’ or harden the blood vessels in order to treat vascular malformations as well as lymphatic malformations. Asclera helps in treating two different types of veins i.e. very small spider veins and smaller varicose or reticular veins by causing inflammation, promoting blood coagulation, and facilitating the narrowing of blood vessels. It offers excellent anesthetic benefits with minimal post-operative maintenance, which make it highly popular among people with unsightly veins. The treatment also helps in treating other related concerns like hemorrhoids and hydroceles. The mechanism of action of the medication is rooted in the procedure of ‘sclerotherapy’, which has evolved significantly over the past few years with the introduction of newer agents. The sclerosing agent present in Asclera is polidocanol. When injected into the target vein, it induces ‘local endothelial damage’ by impacting the endothelium (the cells in the inner lining) of blood vessels negatively. This not only creates cellular debris at the site of damage but also aggregates the platelets there and forces them to form a clot by getting attached to the venous wall. As a result, the vein becomes constricted as well as closed by a dense network of cellular debris, platelets, and fibrin. This occluded vein gets absorbed by the body and connective fibrous tissue replaces it over time. 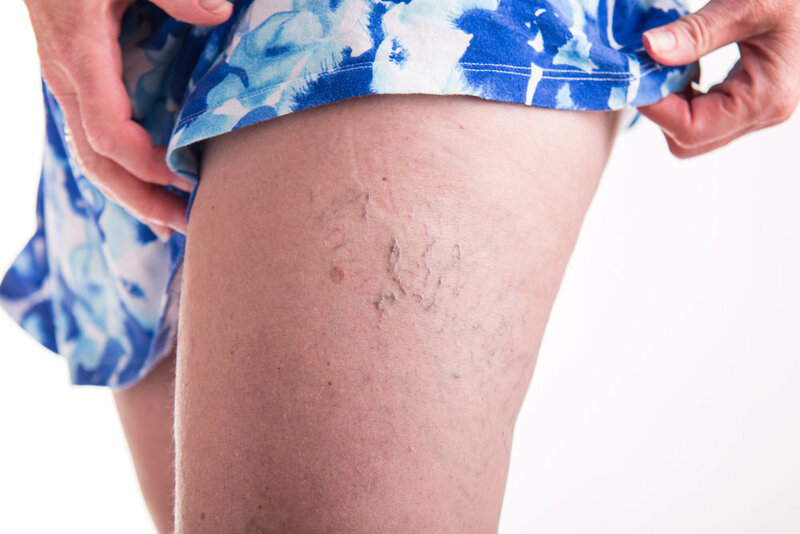 The entire procedure diminishes the discoloration, bulging, swelling, and discomfort associated with the problematic veins and causes them to disappear eventually (2). Asclera is indicated to treat uncomplicated spider veins (≤ 1 mm.) as well as uncomplicated reticular veins (1-3 mm.) mostly visible in the lower extremity of the body. Its effects on varicose veins, which are more than 3 mm. in diameter, are yet to be studied. The injection is supplied in single-use ampules that are intended for immediate use only in a single patient. The strength of Asclera solution and the volume of the injection depend solely on the size of the veins as well as the extent of malformation. 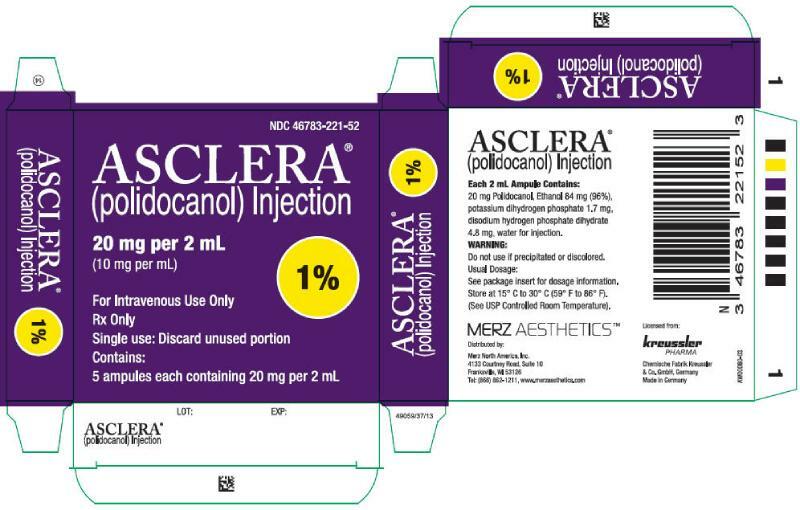 Typically, Asclera 0.5% is used for spider veins and Asclera 1% is used for reticular veins. However, you may need to undergo multiple Asclera treatment sessions if there are extensive varicosities. For this, 0.1 ml. to 0.3 ml. of the medication can be injected into each vein. But make sure that the collective dose does not exceed 10 ml. per session. The Asclera treatment is right for you unless you are pregnant, lactating, or allergic to polidocanol. You should also not have any vein disease or the problem of acute blood clotting. Do not forget to discuss your medical history, existing health issues, and running drugs with your physician in order to determine your candidature. At first, a glass or plastic syringe with a fine needle (26- or 30-gauge) is chosen for administering the medication. Next. it is inserted into the target vein carefully in a tangential direction. Then, the solution is injected into the vein slowly and gently while keeping the needle still inside it. After that, the needle is taken out of the vein and the site of injection is covered. Finally, compression is applied to the area with the help of a bandage or gradient stocking in order to prevent deep vein thrombosis. If there are extensive varicosities, your physician may recommend a larger post-procedural compression treatment for you. This can be performed by using compression bandages or a gradient compression stocking. Each Asclera session can last from 15 minutes to 45 minutes depending on the extent of treatment. If your spider and/or varicose veins need more than 10 ml. of the intravenous solution, you will have to undergo repeat sessions spaced at least 1 to 2 weeks apart. Your physician will make you walk for 15-20 minutes immediately after the treatment. Also, you will be under observation for some time to detect and treat any anaphylactic or allergic reaction. The biggest post-treatment practice for you will be to wear thigh- or knee-high compression stockings or support hose continuously. For spider veins, it will be up to 3 days after the treatment while a whole week is needed for reticular veins. After this period, you can wear those only during the daytime for the next 2-3 weeks. In addition, walk daily for 15 to 20 minutes at least for a couple of weeks. The Asclera treatment comes with very limited downtime and the recovery is pretty quick. Just make sure that you do not indulge in sunbathing, hot baths, saunas, heavy workout, long flights, etc. for 2-3 days. Choosing Asclera can make your spider and reticular veins disappear permanently. But you may need to opt for another treatment if new veins grow there again. Each session of Asclera treatment can cost you nearly $500, which is a little more expensive than traditional sclerotherapy treatments. However, it can vary widely based on the severity of your problem as well as the number of sessions required.